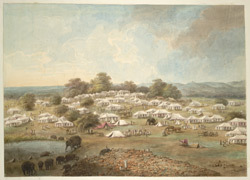 Watercolour of encampment at Kashipur from 'Views by Seeta Ram from Mohumdy to Gheen Vol. V' produced for Lord Moira, afterwards the Marquess of Hastings, by Sita Ram between 1814-15. Marquess of Hastings, the Governor-General of Bengal and the Commander-in-Chief (r.1813-23), was accompanied by artist Sita Ram (flourished c.1810-22) to illustrate his journey from Calcutta to Delhi between 1814-15. Kashipur, in Uttar Pradesh, was named after Kashi Nath, an early 18th century governor who was under the direct rule of the Chand Raja of Almora. At the end of the 18th century the following governor Nand Ram decided to split from Almora, and his nephew Shib Lal subsequently ceeded Kashipur to the British in 1801.